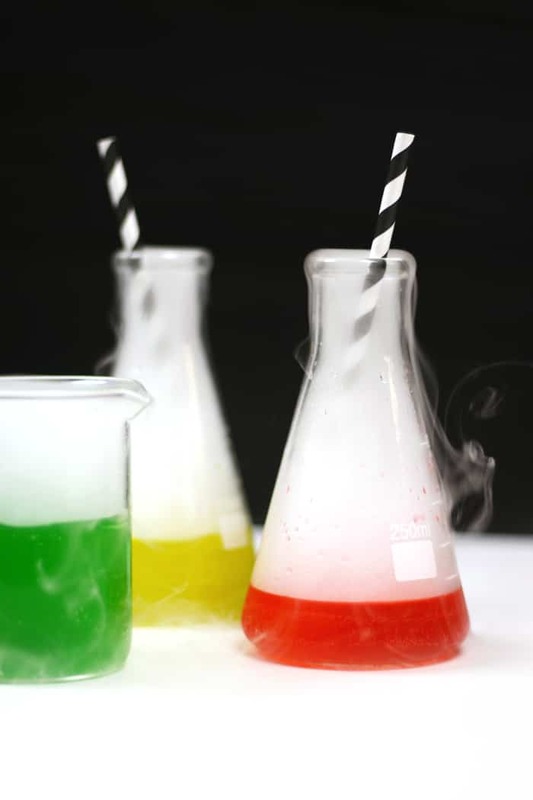 Eery and colorful, these Mad Scientist Cocktails make for a fun Halloween party drink. 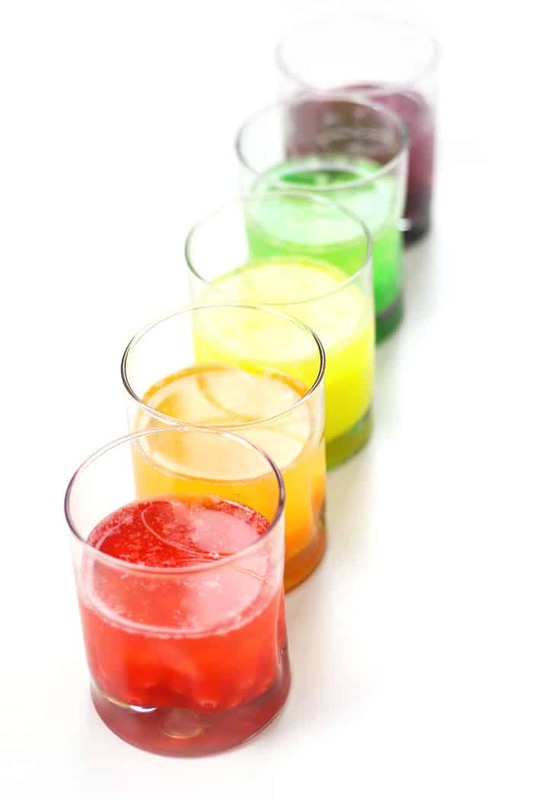 Impress all your guests when you mix Skittles-infused vodka with soda and add dry ice to make it bubble and smoke! This post contains affiliate links. If you click on one and buy something we receive a small commission at no additional cost to you. All opinions are my own, as always! Whenever you throw a party, it’s normal to want to impress your guests. Hosting parties can be so stressful, so I always say you should do the best you can, and your guests will more than likely be impressed no matter what. But, from time to time, it helps to have a party trick up your sleeve. Whether that’s a signature cocktail or a magnificent dessert, serving your guests something they can ‘ooh’ and ‘ahh’ over will always give them something to talk about. And you’ll get tons of compliments, too. Halloween is no different. In fact, it’s probably the best time to try an impressive party trick/treat. These Mad Scientist Cocktails are just that. 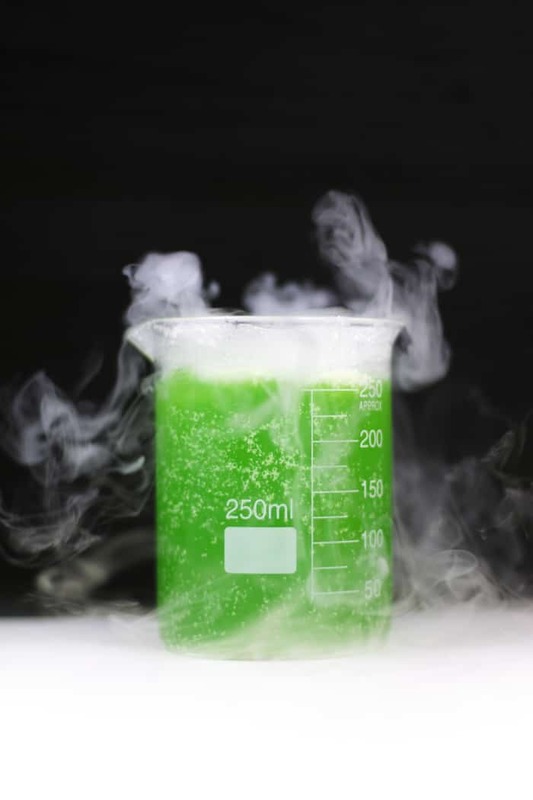 Channel Frankenstein, Dr. Jekyll or your high school chemistry teacher and mix up something totally crazy and creepy. 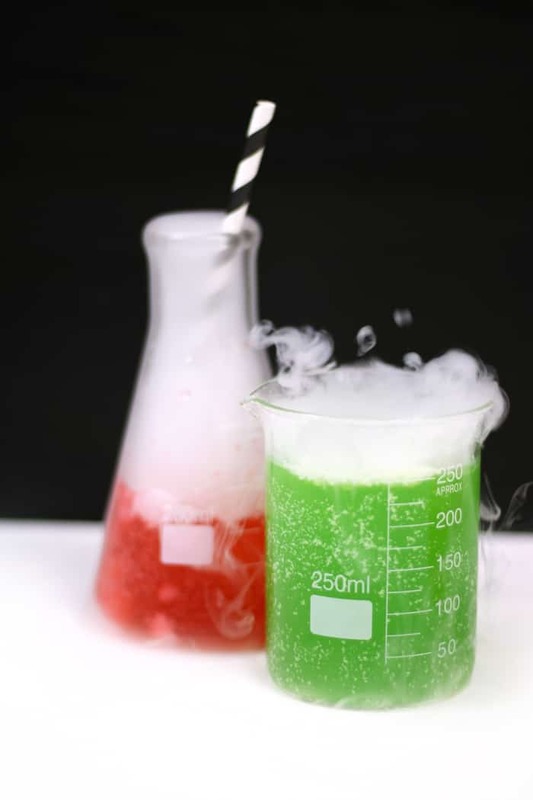 To make these Mad Scientist Cocktails, you’ll need to first make Skittles-infused vodka. Actually, you can substitute any colorful, fruity candy. Jolly Ranchers, Starbursts, Lifesavers — pick your poison. I chose Skittles for their creepy, artificial coloring. Makes it more authentically mad scientist-like, I think. Just separate out the colors and soak them in vodka overnight. Strain out the now-colorless candies and — voila! — you’ve got five shades of vibrantly-colored vodka, ready for mixing. Store it in glass bottles or jars if you’re not going to use it right away. 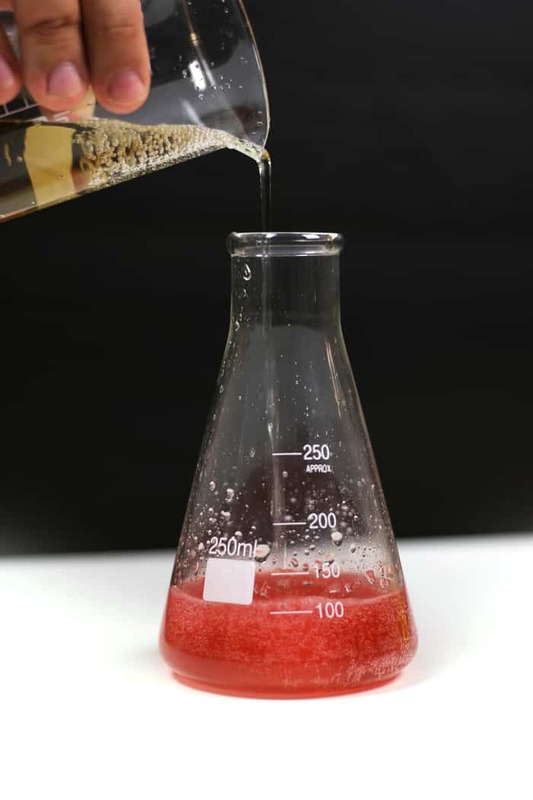 The Mad Scientist Cocktails themselves are simple: a shot of vodka and clear soda, like lemon-lime or ginger ale. Even club soda will do! P.S. Need other Halloween-inspired ideas? 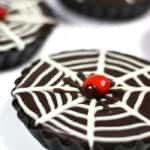 Try my No-Bake Mini Chocolate Ganache Spiderweb Tarts and the Tootsie Roll Cocktail for fun party treats. 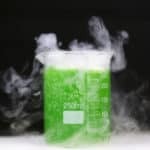 Dry ice tips: You can buy dry ice at most grocery stores. However, note that dry ice is very dangerous! Be sure to wear gloves and use tongs to handle it. To get small pieces, I used a meat tenderizer mallet. 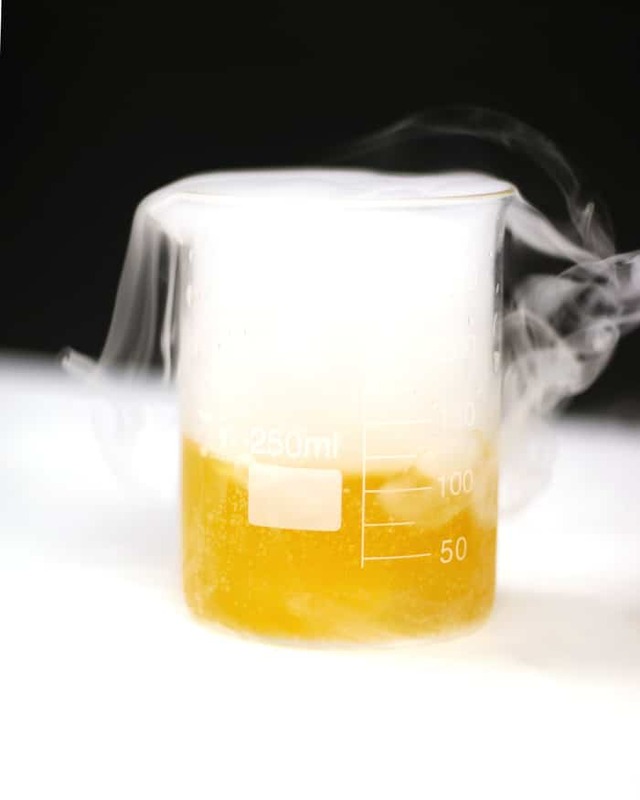 It is technically safe to consume the drink while the dry ice is in it, but don’t let the dry ice touch your lips. Personally, I’d let the dry ice dissolve entirely or remove it before you take a sip. Get more tips for dry ice. 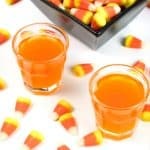 Pin these Mad Scientist Cocktails with Skittles-Infused Vodka! Separate Skittles by color. Place all Skittles of each color into glass cups, jars or bottles. Top with vodka, about 1/2 cup for each. Cover and let sit for 8-12 hours. 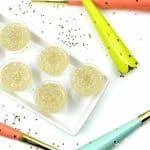 Uncover and strain each color of candies into a bowl or glass jar with a sieve. Discard the colorless candies. If the vodka separated, use a coffee filter. To make a cocktail, add 1.5 ounces of vodka to a glass. Top with 6 to 8 ounces of soda. Add a cube of dry ice. 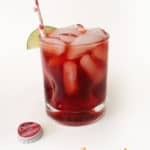 Garnish with a straw, if desired. This is how I like to party.